This is an outstandingly beautiful room with the Wow factor! The large picture windows overlook the River Taw and the room has more than a touch of glamour, with plush fabrics, opulent soft furnishings and designer flair. 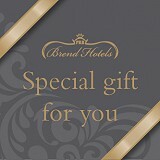 A fresh flower display, fruit bowl, fluffy bathrobe and slippers as well as a selection of decadent Brend chocolates are all part of your experience. The king size bed (or twin if you prefer) is set back in an alcove and the spacious sitting area includes a 50 inch plasma TV and DVD player. A truly stunning suite with the best luxury accommodation in North Devon.